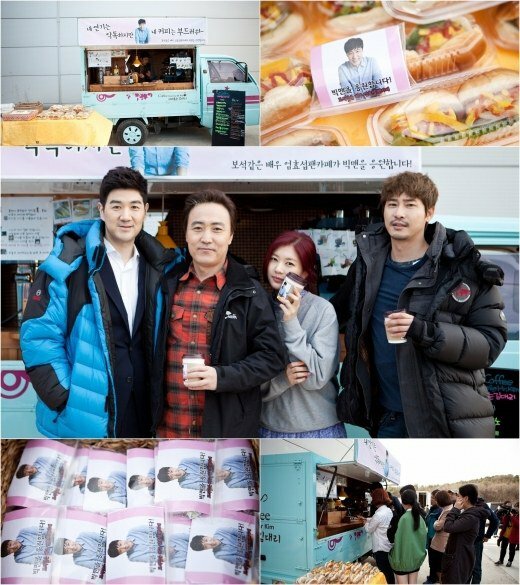 Actor Uhm Hyo-sup's fan café delivered a present to the KBS 2TV drama "Big Man" filming site. Uhm Hyo-sup takes on the role of cruel and evil chairman named Kang Seok-wook of the Hyeon Sung Group. His fans delivered snacks to the site to support him on the 4th. The site was in Anseong and fans brought enough sandwiches and coffee to feed roughly 100 people. The staff and cast who were working really hard without days off really welcomed these thoughtful snacks. Uhm Hyo-sup said, "I am so grateful to my fans for giving me so much support in everything I do. All of us are working as one and we hope to produce a good drama". One of the staff on site said, "The snacks from the fans were a great present as we were all in need of a break. Thanks to them, we re-energized and managed to complete the day's work in cheery moods". Meanwhile, "Big Man" is about a man who lived a low life, getting the chance to be the son of a wealthy family and protecting the ones he loves. This drama will be aired for the first time on the 28th of this month. ""Big Man" Uhm Hyo-sup's fan club delivers 100 sandwiches and coffee"
Choi Jin-hyuk to star in movie "Trot"